In so many ways it's hard to believe that it's been two years since my knee surgery. There are times that I feel like there is no way two years have already passed and there are times that it's totally believable (like when I'm able to move around without pain). 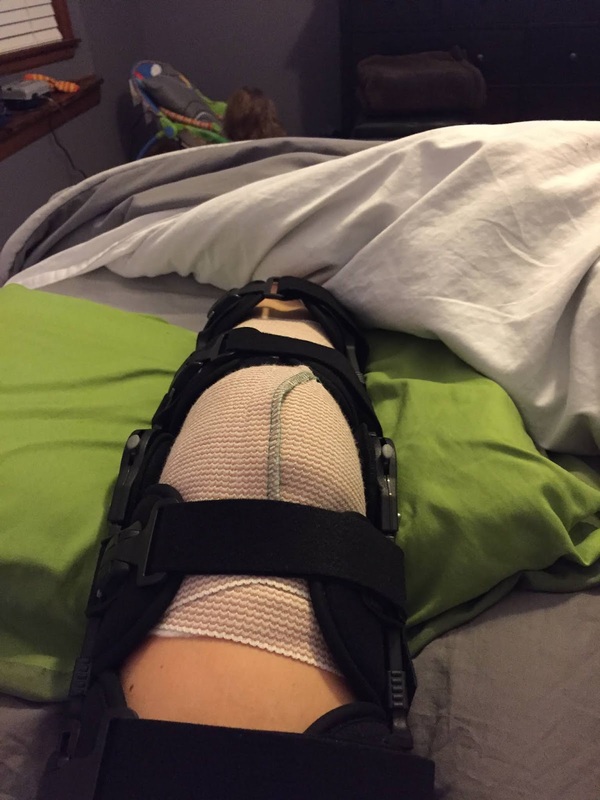 But no matter what it feels like, it has indeed been two years since I had my knee surgery. Knee surgery was easily one of the most painful experiences I have ever gone through. There can be an argument made that child birth was more painful and in the short term that was totally more painful but the aftermath of knee surgery definitely takes the cake. I went through years of my knee randomly dislocating and yet that was nothing compared to what I went through trying to get my leg back. I was excited about the idea of my knee staying where it was supposed to which is why we went forward with the surgery and the first couple days weren't bad. I was in a terrible leg brace that kept my knee from bending more than 30 degrees, which as it turned out I couldn't have done if I wanted to. I was on crutches and pretty immobile. But the first couple days I also had a nerve block from the surgery, but after it wore off it was a lot of pain. Showering was basically impossible. I had trouble sleeping thanks to the giant brace and I often would wake up in a full panic attack because I felt trapped in the brace. There were many nights that Rob would just help me get the brace off and bend my knee just a little bit so I could settle down from the major anxiety I was feeling. Then there was PT. I started by doing some basic exercises at home. But I found that I couldn't lift my leg. My entire quad muscle on my left leg was gone. I had no strength to do anything. I had to start going to PT three times a week to work on my flexibility and strength. The strength part wasn't horrible although I couldn't do a lot at first. But the flexibility about had me in tears every time I had to go. Basically because they had cut my tendon and stitched it back together again, it had to be stretched back out so my knee could bend again properly. Slowly they would bend my knee and would tell me just to breathe through the pain. I did a lot of breathe and wanted to do a lot of crying. But if they didn't do it then my knee would bend about 30 degrees then automatically straighten again. We had to retrain my knee to bend. In fact we had to retrain my knee to do everything. I couldn't figure out to do basic things. It was almost a year later before I could run again. I had to figure out how to step up on a stair the right now. I had to learn how to wipe my feet on a mat. I had to learn how to do basically everything. I knew I knew how to do it and I could do it with my right leg but I just couldn't get my left to do the same thing. It was actually very frustrating. And it was it a long process. Two years later, I would say I'm back. My muscle is still a bit smaller than my right side but that will probably always be that way. But I can do everything. At times I still have the fear in the back of my mind that I will hit it on something and dislocate it again. Or more so now that I'm pregnant and everything is more flexible, I worry that it will happen now. But mostly everything is back to normal without the random dislocating. It took me a long time to see that having knee surgery wasn't a mistake. The year following the surgery was such a struggle that I had a hard time seeing everything wrong with the decision I made. But two years out I feel better about it. I'm not doing all the exercises I was doing before the knee surgery - because I'm pregnant - and I know that I struggled some when I did a little after surgery and before getting pregnant but it's just about building that muscle up more. So do I still regret that decision? Not so much but it did take me a long time to get there.